Swiss Franc continues to strengthen against the USD. One of the reasons of decline in the pair is instability in the political situation of Ukraine and possibility of sanctions, which the US and EC threat to take against Russia. Nevertheless, situation can change dramatically as soon as US monetary authorities will tighten monetary policy and raise interest rate. Such decision will help the USD regain losses and go up against world currencies. In the current situation support level is 0.8700; if this level is broken down, Swiss France will continue to strengthen. 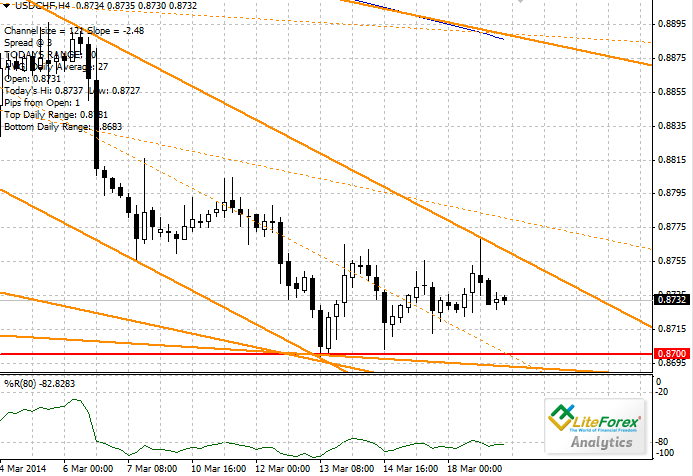 The nearest resistance level is the upper limit of the trading channel - 0.8768. It is recommended to open long positions after breakdown of the level of 0.8768 with protective order at 0.8740 and a target of 0.8875.